Looking at the circumstances around opposition leader Nawaz Sharif’s return to Pakistan, one has to believe that there is a deal between Musharraf and Sharif, despite Sharif’s vehement denials. Or, more likely, that there is a deal between Musharraf and Saudi Arabia and between Saudi Arabia and Sharif, with the Saudis acting as guarantors and providing the necessary degree of separation and deniability both two faux-democrats need to maintain their credibility as political leaders. Because, absent a deal to guide and constrain Sharif’s actions, it is difficult to look at allowing his return as anything less than political suicide by Musharraf. This can be understand by looking at Punjab—home to 86 million people, the richest of Pakistan’s four provinces and the center of its politics, the key to power in Pakistan--and the political base of Nawaz Sharif and his PML-N party. Since Sharif’s departure from the scene, Musharraf moved to secure Punjab by midwifing a new Punjab-centered political party, the PML-Q, and lavishing patronage on its chief—and his main parliamentary ally-- Chaudhry Shujaat (not to be confused with the Supreme Court Chief Justice). But all that looks like it might all be swept away by Sharif’s return. 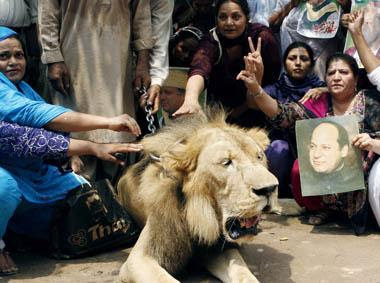 In addition to his innate reserves of charisma, the surviving organization of his party, the electorate’s general disgust with all things Musharraf, and having a real, live lion show up to greet him at the airport—and despite his reputed legacy as a corrupt politico who once had his ruffians storm the Supreme Court, the same institution for which he now professes such a tender regard--Sharif has Saudi good will and possibly Saudi money to spread around in the service of his campaign. Sharif filed papers to run for a parliamentary seat—indicating that his party will not boycott the elections (hint of a deal there) and triggering a flood of speculation in the Pakistani press that PML-Q will be decimated by a surge of support for Sharif and Chaudhry will fade into irrelevance. So, unless Musharraf wanted to shatter his base of support in Pakistan’s most important province, gut the political party that provides him with his only parliamentary cover, and, in essence, destroy his tenuous hold on power while he’s attempting a difficult transition to a civilian presidency, he’s not going to let Nawaz Sharif return without a deal, even if Saudi Arabia and the United States are wagging disapproving fingers at him. And it’s not inconceivable that Musharaff would sacrifice Chaudhry for the sake of a deal with Sharif. Chaudhry is apparently corrupt in a big way—the besetting affliction of Pakistani politicians, it seems—and was a practitioner of the politics of appeasement with Islamic extremists, a policy that fell by the wayside with Musharraf’s assault on the Lal Masjid mosque in July (which bloodily terminated Chaudhry's prolonged negotiations with the leaders holed up inside the mosque). While detesting Nawaz Sharif as his competitor for power, Chaudhry is also terminally on the outs with Benazir Bhutto (whose renegade brother, in an interesting twist of Pakistani politics—small world!--was reputedly responsible for the murder of Chaudhry's father) and would probably be able only to orchestrate a parliamentary alliance on behalf of Musharraf with some Islamicist parties—the kiss of death as far as U.S. support would be concerned. (For this perspective, I’m indebted to a prescient analysis on the Pakistan blog Watandost that parsed Chaudhry’s shaky political standing back in June of this year). So Chaudhry and his inability to coexist with Sharif and Bhutto perhaps became a liability that Musharraf, in his extremity, could no longer afford. And perhaps Musharraf made a deal, via Saudi Arabia, agreeing to condone Sharif's triumphal return to his privileged position in Punjab as a politician of national stature in return Sharif's support of Musharraf's second term as president. Generalissimo Pervez Musharraf is not at his own. He is now fighting for himself, and has clarified it to Chaudharies that now they have to earn their keep at their own too. Its now the game of ‘survival of the fittest’. Nawaz Sharif’s calm and cool tone is giving creeps to the Chaudharies and lots of lotas. Lotas are desperate to roll and wring, but still they are not finding a leeway. These chathas, Wattooes, Tawanas, Mazaris, Legharis, Chaudharies, sials, tarrarrs, sheikhs, haqs, and other chronicle waderas and Jagirdars have sensed the tide of change, and they are finding it much harder this time to find their niche. Chathas, Wattoes, and Tawanas oh my! What are all those things? Specifically, what is a lota? A rolling and wringing lota? 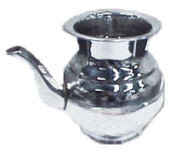 While a lota is technically an urn used to clean oneself after going to the loo in South Asia, the term has been used to describe opportunistic politicians who have no qualms in switching sides whenever they feel that the tide is turning. More details—including a cautionary tale for people who find a coffeemaker in their motel bathroom--can be found here. So, think Pontius Pilate washing his hands; or “I’m going to wash that [inconvenient former ally] out of my [hair]”. That’s what some people call the PML-Q—the Lota party. The other terms in the jeremiad refer to influential families, landlords, and feudal lords (presumably hyperbole) who may find that being cosseted by Musharraf for the last few years is a political black mark now that Sharif is back and getting ready to call the shots. In contrast to Bhutto, who grotesquely over-reached and counterproductively traded on her U.S. support, Sharif seems to be playing his political hand with considerable skill and coolness—a fact that has probably not escaped Pakistanis wearied of Musharraf’s spectacular ineptness as a political leader. In an interesting move for a politician who once tried to get himself anointed “Defender of the Faith”, upon his return Sharif visited the Datar Durbar complex, the tomb of a Sufi saint revered throughout South Asia. 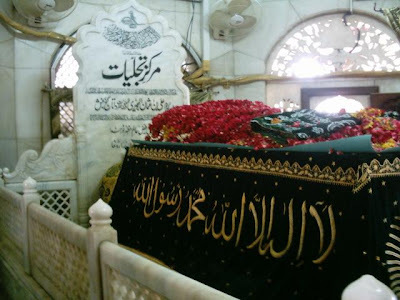 Sufism is at the heart of Punjab’s cultural identity and Sharif visited the tomb no doubt to play up his Punjab roots but also to place some distance between himself and Saudi Arabia, which considers itself the arbiter of Islamic orthodoxy and looks askance at Sufism. Sharif outlined his stance on the elections in an interview on Monday. He’s being rather equivocal on the issue of the boycott, more so than the Western press—which usually describes him as “calling for a boycott”--reports. LAHORE: Pakistan’s ex-Prime Minister Mian Muhammad Nawaz Sharif said Monday that the opposition should use the option of boycotting the general elections in case a level playing field is not provided to it in the electioneering process. He was addressing a press conference at his Model Town residence here on Monday. Former Punjab chief minister Mian Shahbaz Sharif and PML-N leader Saranjam Khan were also present.Nawaz Sharif said the opposition do not want to indulge in any confrontation or to boycott the polls, but it will be left with no other option if it is pushed to the wall. “We believe in reconciliation and Pakistan’s welfare, not in confrontation; the people at the helm of affairs need to understand the feelings of the people and act according to their aspirations to remove emergency and restore the rule of law in the country,” he said. He demanded lifting of the emergency, restoration of the constitution and reinstatement of the judiciary as it was before November 3 and said that the judicial setup prior to the emergency be allowed to decide the matter of the presidential election. It’s clear that Sharif wants to use the threat of a widespread boycott of the parliamentary elections by his party and Bhutto’s to force Musharraf to lift the State of Emergency. Winning such a confrontation would give Sharif considerable momentum going into the poll, as well as making it more difficult for Musharraf to pursue whatever skullduggery he might consider in order to dilute Sharif’s success in the elections and play off a weakened PML-N against Bhutto's PPP as a coalition partner. The dealbreaker (if there is a deal, of course) is Sharif’s demand for Musharraf not only to reinstate the judiciary but to allow the profoundly anti-Musharraf courts to decide on the legality of Musharraf’s (blatantly illegal and unconstitutional) State of Emergency. If that were to happen, Musharraf would not only surely lose his job as president; he would fall under the same kind of extreme legal jeopardy that afflicts every Pakistani leader, Bhutto and Sharif included, who come out on the losing side of a political struggle. My prognosis: ain’t gonna happen. At least the part about re-opening the case of Musharraf’s presidential election. Musharraf is never going to lift the State of Emergency if Sharif’s threat is real, and I wonder if the popular or international support would be there either. That’s exactly the kind of destructive judicial vendetta that has poisoned Pakistan’s politics for the last two decades. The judiciary might be reinstated, but stripping Musharraf of his presidency and putting him on trial should be short-circuited by talk (encouraged by the U.S., the Saudis, and Pakistan’s army and already tacitly agreed by Sharif and Bhutto) of national reconciliation. If Sharif plays the electoral endgame with finesse, emerges as the recognized power broker, reneges on whatever understanding he had with Musharraf, gains the upper hand over Musharraf, and wins the support of the army, the Saudis, and the United States as Our Man in Pakistan—no slam dunk—then maybe Musharraf goes. And if Mush does go, he goes quietly after the election—and without the threat of a jail term over his head.